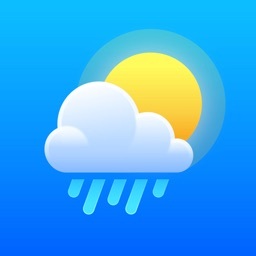 WeatherFX is an app that is helpful to people who either work or play outdoors. 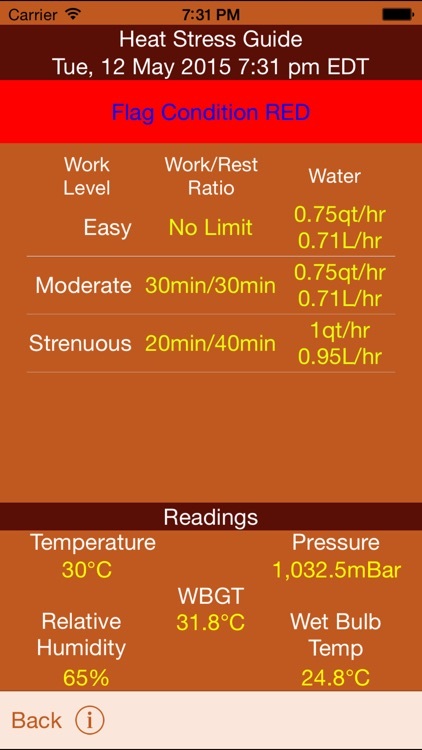 The app can provide guidance on work/rest ratios and fluid intake due to high temperatures. 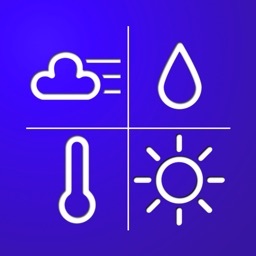 WeatherFX is an app that can retrieve temperature, barometric pressure and relative humidity based on the iPhone/iPad GPS data. 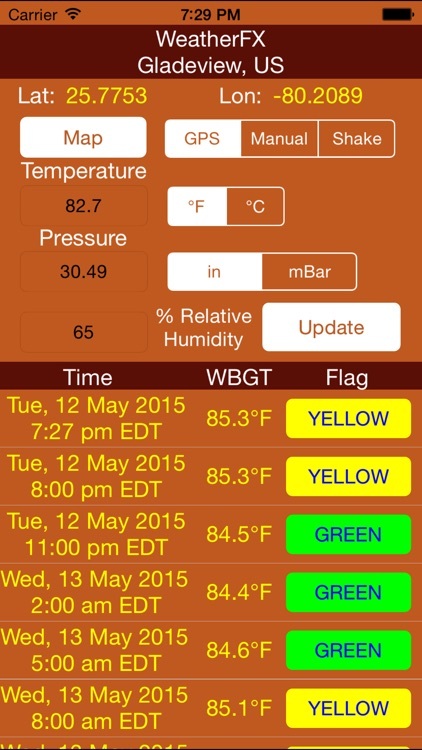 The app will also approximate the wet bulb and wet bulb globe (WBGT) temperatures from the retrieved values. Please note that the WBGT is just an estimate. The estimate does not account for wind or low light conditions. The estimate is based on a moderate amount of sunlight. 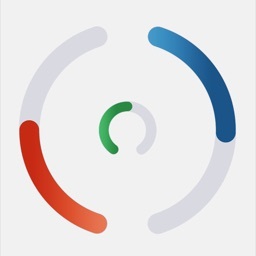 True WBGT can only be acquired through WBGT instrumentation. 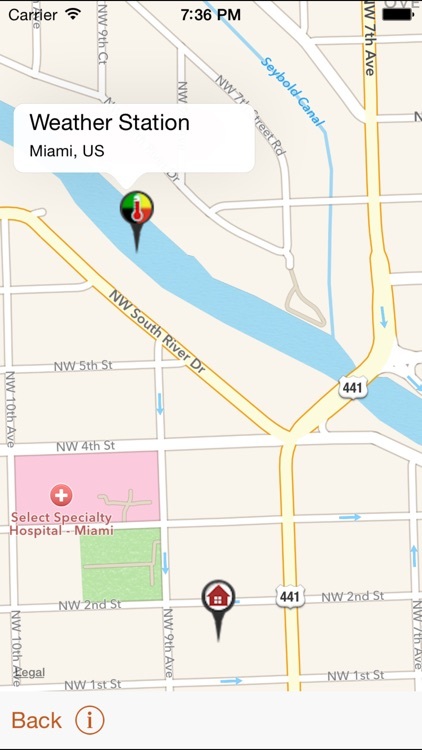 Once you accept the prompt to acquire the GPS position, the Latitude and Longitude labels will be populated. 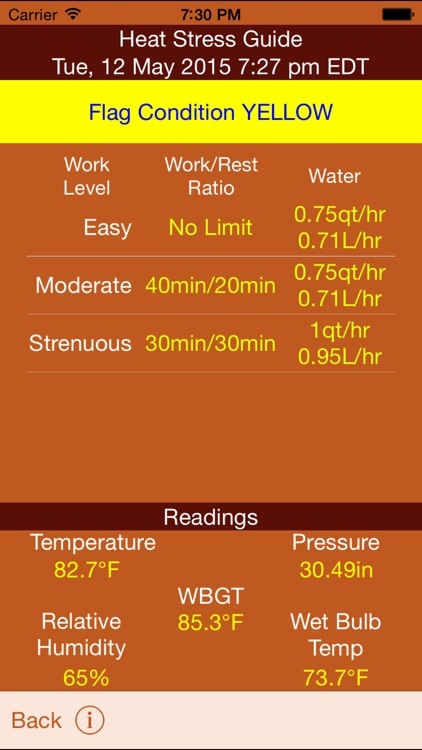 Click the “Update” button and the app will populate the temperature, pressure and humidity text fields based the closest weather Station ID to your position. 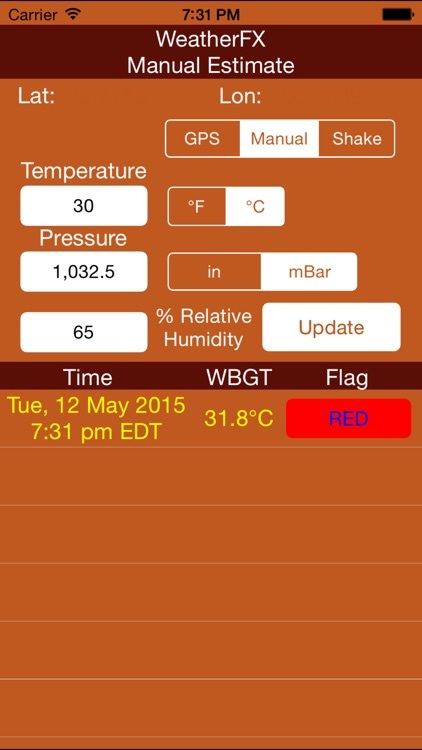 The app will then calculate the wet bulb and WBGT temperatures. You'll also notice that the WeatherFX app will place the location name and time of the reading at the top of the screen. This way you will know if the readings are in your location and timely. Besides acquiring the weather from GPS you may get your own estimates for wet bulb and WBGT temperatures by typing temperature, pressure and humidity into the respective text fields. Click the “Manual” segmented button, enter the white fields followed by clicking the “Update” button. 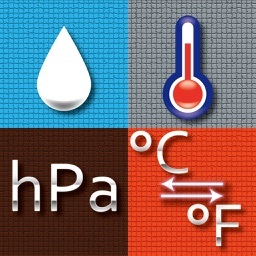 The app will also compute random numbers for temperature, pressure and humidity clicking the "Shake" segmented button. The device may be shaken and new settings will populate the fields. 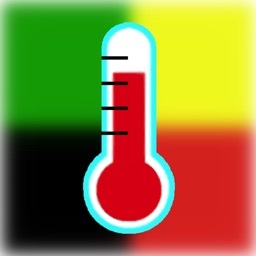 Click update button and the random wet bulb and WBGT temperatures will be computed. After an update has been executed, you may use WeatherFX to quickly convert temperatures from Fahrenheit to Celsius and vice versa by clicking the desired “°F” or "°C” segmented buttons. 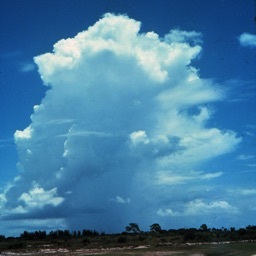 Barometric pressure may be converted from inches mercury to millibars and vice versa by clicking the desired “in” or “mBar” segmented buttons. After an update you will be presented with a flag condition button on the bottom left of the screen. The flag condition is derived from the WBGT estimate. If the flag condition is not “NONE”, you may click on the condition to yield work to rest ratios and water consumption given the current estimated flag condition. These figures are posted as a quick and portable reference only. Guidance for these figures are acquired from the U.S. Marine Corps Order 6200.1E dated June, 2002. You are strongly advised to read the complete guidance to know what each entry means.